Welcome to Changing Time Signatures – Part 22f in our Time Signatures mini-series within the Music Theory Level 2 Section of the overall article series Scales in Music – a Tonal System. Every once in a while a composer may want to change a time signature during the course of a music composition. Although this is a rather easy thing to do, many may not know how to write the music for making this type of notation change. In addition, they may not know what impact changing time signatures will have on the overall sound of the resulting music. Consequently there are left with questions this article addresses. For example; let us assume you wish to change a time signature at a specific point in the music you are composing. What tools would you use to do this? Where would you place those tools? What if you wanted to change it back at a later point in the music? How would you do that? All of these questions and more will be answered in Changing Time Signatures – Part 22f. The study of music theory is encompassing of many specific tools all of which are necessary for you to learn in order for you to become proficient in writing music. For this article, it is important to understand what a Time Signature is and what note and rest values provide the notation basis for a given time signature. With that said we suggest being familiar with the contents of the additional articles in the Time Signature article series; Parts 22a, 22b, 22c, 22d and 22e, as well as reviewing the Musical Note and the Note Identification articles necessary for understanding note and rest values. It would also be a good idea to review the article Speed in Music – Tempo which will assist you in understanding more about tempo and its influence on time signatures. If you are comfortable with the information contained in the prerequisite articles then please proceed with your study of Changing Time Signatures – Part 22f. The symbols used for a time signature are made up of two parts or numbers. The top number is called a numerator and the bottom number is called a denominator. The top number instructs us on how many beats there are in a measure. The bottom number tells us specifically which note value gets one beat. The above example states that there are four beats in a measure and a quarter note gets one beat. There are many different time signatures including; 2/1, 2/2, 2/4, 34, 4/4, 5/4, 3/8, 6/8, 12/8, etc. Every composition begins with a set of symbols, one of which is the time signature. Once it is determined and placed on the staff all measures of music within the composition are guided by the active time signature designated at the beginning of the musical work until such time as it is altered. Once altered the new time signature takes precedence over the original placed at the start of the composition. Likewise, it remains active until it is once again changed to another time signature. In modern times, it is very commonplace to begin a piece of music using one time signature and then changing the time signature to a different one all together. It is also commonplace to do this often. Most of the time the change is desired to be in effect at either the beginning of a passage, the beginning of a phrase or at the beginning of an entirely new section of music. Generally, the time signature symbol is always in effect at the beginning of a bar or measure of music. Also, many composers will use a new time signature if there is also a key change in the music. In all cases there are a few considerations to think about when changing the time signature. Here is a list of some of them. Performance Style – Broadly speaking, it is common for a composer to designate a specific performance style in a piece of music. For example; playing music in ¾ time such as in a waltz would not sound like a waltz if we were to use a 2/4 time signature in place of the ¾ time signature commonly used for a waltz. The 2/4 time signature is more commonly used in a Polka or a March for example. Another example would be to use the 4/4 time signature in a hard rock piece with a time signature change to 12/8, a time signature commonly delegated to the blues. In principal, styles of music should always be considered when altering time signatures within a single music composition. Tempo – There are many tempos to choose from when writing music. A slow beat per minute rate such as a quarter note at 40 bpm does not quite fit the much faster tempo such as a quarter note at 200bpm if you are seeking to maintain a mellow or quiet effect through the music. Tempo and its effect on music was introduced in our article titled Speed in Music – Tempo and will be presented in a different light in the next part of this Time Signature Series. Key Signature – Although this information has not been presented as of the writing of this article, the key signature plays an important part and is yet another consideration when changing time signatures. To blindly change the key signature to one that is a non-diatonic key signature or an inappropriate minor key for instance which would drastically alter the impact of the nature of the sound and even more so if the time signature was also changed simultaneously. It is not so much that fact that this cannot be done as it is should they be done while maintaining musicality? There are specific guidelines for making changes in the key signature just as there are guidelines for making time signature changes. Desired Mood or Effect – Altering time signatures can greatly affect the mood the music is conveying to the listener. For example; changing the time signature to a mellow easy listening instrumental piece in 4/4 would significantly alter the effect or mood of the music if played in cut time for example, twice as fast. Intended Media – Depending on what media you are composing for you will want to take this into account when utilizing time signature changes. For example; a composer writing for a motion picture will find it necessary to change time signatures frequently to stay in sync with the film. Contrarily, if a composer is writing for a stage dance they will likely not change time signatures or if necessary, they will make time signature changes infrequently. Commercial Appeal and Market Focus – If a composer is writing for the general audience within a specific genre of music, they will likely keep to a minimum the number of time signature changes whereas a composer writing for a commercial advertisement may not use an altered time signature at all, however, writing music for a website may involve several time signature changes to create specific moods for specific pages of the site. The idea here is to remember who your audience is and to consider what market you are focusing your writing for. Commercially, if you are writing for radio airplay you will not likely choose exotic time signatures rather simple time signatures are likely to draw a wider audience. If you are looking to sell a million CD’s it is likely that you will use some strategically placed altered time signatures which are familiar to your audience whereas a composer wishing to create music for a small group of his or her friends may take the wild card and go for the gold as far as making many time signature changes. Time Period Music – If as a composer you are writing classical music for a film placed in the 18th century, you may want to consider no time signatures changes or very few at best. If you are writing more modern music you would not want to do the same as more modern music utilizes much more frequent time signature changes then music written in the eighteenth century for example. Summary – As you can tell there are many considerations to consider in reference to time signature changes. What is important to think about is who your intended audience is and is there a resulting composition that sounds musical? Use your own ears and your own reactions to the music you are writing. As you develop as a composer you will be better able to determine when and what time signature changes are needed to be made to meet your own compositional goals. When considering a change in the time signature, it is important, in fact more important, to make time signature changes where the resulting music still sounds musical. Since changing time signatures can completely alter the feel of the music even though this idea may sound obvious and mundane there must remain some continuity in the resulting music. Most time signature changes occur either at the end of a phrase, a section of music or when a key signature change occurs within the composition. In all cases it is customary to change the time signature at the beginning of a measure of music rather than in the middle of a measure. Making many time signature changes within a short period of time will also limit you ability to find artist/performers willing or able to play your music. It is always best to consider this aspect as well. Let’s begin with the basic piano staff as shown below. Both the Treble clef and the bass clef are used when notating for piano. A bracket on the left is used to tie the two staves together. The measure line on the right ties them together as well. The instrument name, in this case Piano, is placed to the left of the chart midway between the clefs. 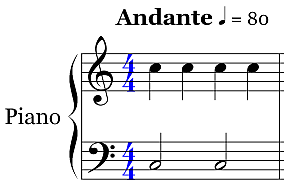 The opening time signature symbol for the composition is placed just as presented in other articles in this series, just after the clef symbol. This is shown in the next chart. We have highlighted the time signature in blue. Whole rests are used in each measure. As a reminder the 4/4 time signature instructs us to perform four beats per measure and a quarter note gets one beat. Next, let’s add a tempo to our graph as we continue to develop the example being used in this article. For purposes of this example we will be using the Andante 80 tempo which represents 80 beats per minute. 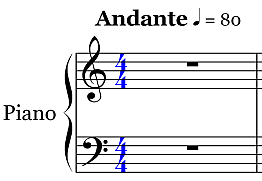 The notation markings for the tempo is place above the staff as shown in this next chart. Next, adding four quarter notes on this staff, placing them on the treble clef line as shown in the next chart, begins the compositional processes for making new music. To make this presentation more complete let’s also add two half notes on the bass clef. Aside from placing the notes as described on the staves nothing else changes at this point. By extending the notation out over a total of four measures our chart would look like the one below. Again, when adding the additional measures and their respective notes nothing else changes in the chart. An mp3 is provided so you can hear what this sounds like. Next, this article is a bout changing time signatures. With that in mind let’s change the time signature in measure five to 6/8. In the chart below the time signature of 6/8 was added in red. This change causes an important difference, through the new time signature instruction, to alter the number of beats in the measure as well as what note value gets one beat. In this case, the new instructions includes changing to six beats per minute where an eighth note gets one beat. Consequently we cannot add only four quarter notes to the 6/8 measure. We must add note values as instructed by the time signature. This is shown in the next chart. The first four measures are in 4/4 time while the second group of four measures is in 6/8 time. Secondly, we have not altered the tempo so any change in the sound is a result of only the change in the time signature. We have added some notes to the 6/8 measure to see and hear those differences. We have also added additional measures to make the necessary audio observations easier to recognize. Visual Analysis –In the above example, the time signatures, 4/4 and 6/8 are in simple time. Secondly, each time signature symbol and its related instruction are different as previously pointed out. Thirdly, we have added the 6/8 time signature symbol just after the first bar line in measure 5 and the 6/8 symbol was placed on both the treble and bass staves. Again, the tempo designation was not changed. When comparing the note values in the first two measures of each time signature symbol, we can observe that the note values are completely different while at the same time they are in alignment with the instructions as designated by the active time signature. Please take a moment to make the distinctions between the note values under the 4/4 time signature as opposed to the 6/8 time signature. This is a good exercise in so far as it ties together other lessons within this article series supporting previous thinking and analysis of the impact of time signatures when creating and notating music. Hearing Analysis – When listening to these eight measures we can hear plainly that there are distinct differences between the 4/4 and the 6/8 time signature measures. Specifically, the 4 beats versus the eight beats makes an obvious and significant difference in the playback of the notes involved. Each has its own feel and each creates an emotion within us different than the other. Notice how even though the time signature 6/8 provides for 6 beats per measure it makes the playback sound faster even though the tempo was not changed. As a composer, it is important to make decisions about altering time signatures relative to the overall impact of making a change. This should be considered not only in a short section of music but in the overall composition as well. Remember, we want to maintain the overall continuity of the composition. The above measures of music are not necessarily musical as such, more of a drone sound rather than enjoyable melodically based piece of music. The music in this chart may be used as an introductory piece, such as in a New Age work, or as an underlying rhythmic pattern when other instruments are involved, such as in a full orchestral piece. Next, we can also alter the note values to make it sound more musical. Let take a look at this idea. I’ve put together this short piece to demonstrate this concept using the piano as the instrument and making several time signature changes within the written music. A sample mp3 clip is also provided so you can hear the changes within the music. You may want to play it several times to get a complete understanding of the impact of both the time signature changes as well as the effect of adding the melodic line in the bass clef. Analysis – We have continued to build upon the previous examples used earlier in this article, where a piano staff is still being used with a tempo of Andante 80 beats per minute. At this point, the treble staff is presenting the C notes only throughout the piece and the bass staff is now presenting a four measure melody line. We have removed some measures to show how you can utilize time signature changes in such a way as to cause the final piece to sound more musical in nature. We have also added the ¾ time signature to demonstrate some additional note value comparisons. For the opening measure we are using the 4/4 time signature immediately followed by the 6/8 time signature. 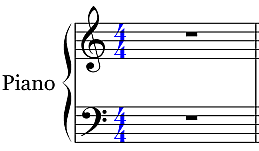 The remaining measures move back to the 4/4 in measure three, ¾ in measure four and back again to 4/4 in measure five. In each time signature change the placement of the new symbol is placed just after the barline of the applicable measure. Lastly, each time the time signature is changed we must meet the requirements of the new time signature and not follow the previous one unless and until it is changed back to the original. Lastly, there is one more detail to know about as far as this article is concerned and as related to time signature changes. The chart below represents the last measure of a line of music. When making a time signature change which falls on the first measure of the proceeding line of music it is important to place an alert for the performers that an upcoming time signature change is about to occur. This chart chows how you would let them know. Remember this is the last measure of a full line of music. It would be on the far right hand side of the score. Notice how a partial measure is shown with the time signature placed in the same location as in normal or full measures. Next, when taking a broader view when learning about adding the time signature symbol at the end of a line of music, the chart below shows two lines of music where the last symbol is placed notifying the performers of the upcoming time signature change. The chart also shows various time signature changes including the last measure of a line of music just discussed. We have removed the notes to enable you to see the various changes and how they are being made. Notice how as each time signature change is made the new time signature symbol is placed at the beginning of the applicable measure just after the preceding measure or bar line. 3) Time signatures are placed at the beginning of the bar of music and located just to the right of the preceding bar line. 4) Place a time signature symbol at the end of the line of music if the time signature change falls on the first measure of the next line of music. 5) All instructions provided for by a time signature must be met. 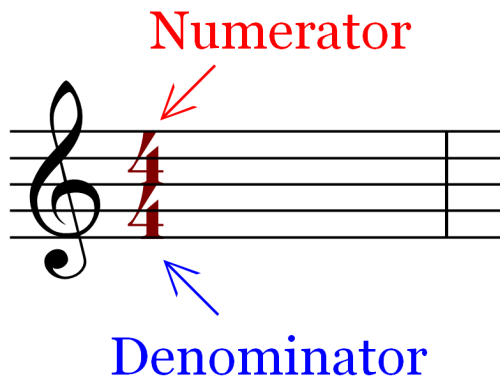 This includes the number of beats per measure and which note value gets one beat. 6) Time signature changes can drastically alter the feel of the music or create completely different emotions in the listener. 7) You can change time signatures as often as you like and to whichever you want provided the change maintains continuity and musicality in the score. It is quite a common for time signature changes occur in music, especially modern music. Please take your time to understand the requirements and guidelines for changing time signatures. You will find that making these types of changes opens up an entirely new avenue and set of tools for you to use as a composer of new music. Have fun and create some beautiful noise! Note – All graphics were made using Sibelius Music Software a product of Avid Technologies. Also, all sound clips were produced using sound samples from the sound sample collection called Colossus, a product from East/West – Soundsonline and finalized in Wavelab a product of Steinberg.